Hyundai’s latest success in the hugely competitive Indian car market is the Santro hatchback. The South Korean automaker has managed to put 50,000 units of the Santro on Indian roads in less than 6 months of launch. The car competes with the likes of the Maruti Alto K10, Renault Kwid 1.0, the Tata Tiago and Maruti WagonR 1.0. It’s Hyundai’s entry level car for the Indian market and has replaced the Eon. Monthly sales of the Santro are hovering around the 8,000 unit mark. Prices of the Santro start from Rs. 3.9 lakhs, ex-showroom Delhi. At launch, Hyundai had indicated that the prices of the Santro were introductory, and that they would go up after 50,000 units of the car were sold. 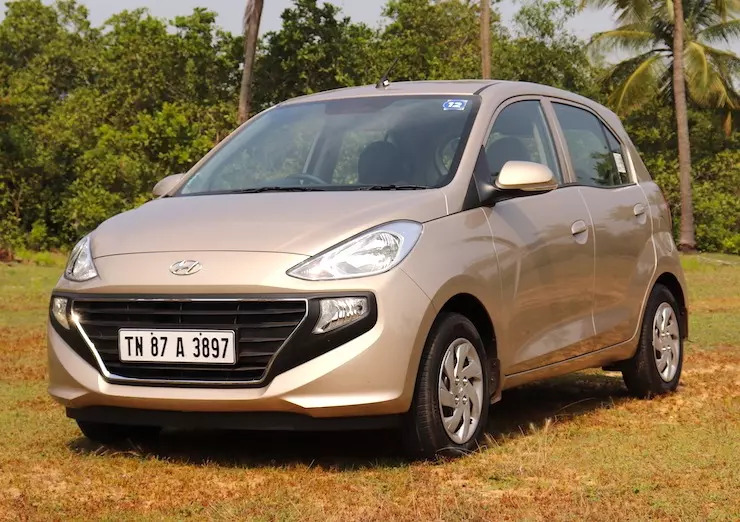 However, it’s unlikely that Hyundai would increase prices of the Santro in a big way considering the overall sales slowdown in the Indian market. Also, the Santro is already available at a discount (3 grams gold coin and a Rs. 20,000 exchange bonus). So, Hyundai may actually end up keeping Santro prices unchanged, at least for the time being. The Santro is available with a single engine option: a 1.1 liter-4 cylinder naturally aspirated petrol that makes 68 Bhp of peak power and 101 Nm of peak torque. This engine is also sold with a CNG-Petrol dual fuel trim. While running on CNG, the motor makes 58 Bhp-84 Nm. The Santro’s petrol variants are available with 5 speed manual and AMT options. The CNG trim is available only with a 5 speed manual gearbox. Hyundai is also likely to offer an LPG-Petrol dual fuel version of the Santro in future. The original Santro, which made its debut way back in 1999, made South Korean automaker Hyundai, a household name in India. Promoted by Bollywood actor Shahrukh Khan, who was at his peak back then, the Santro established the Hyundai brand in India. The car – across various iterations – enjoyed a production run of 15 years, before being discontinued in 2014. Nearly, half a decade later, in 2019, Hyundai relaunched the Santro brand in India, and Shahrukh Khan continues to be the brand ambassador of the car. The new Santro is a lot more feature-rich than the older version. Keeping with the times, the car even gets a touchscreen infotainment system with Android Auto and Apple CarPlay. The Santro now offers airbags, ABS+EBD, reverse parking sensors, ISOFIX child seat mounts, speed alerts and seat belt reminder as standard safety features. The car is already doing much better than the Eon. The next big update for the Santro will come in early 2020, when Hyundai makes it compliant with Bharat Stage 6 emission norms. A mild price hike is likely when this happens. « What future Mahindra Cars would look like: Thar to Scorpio!